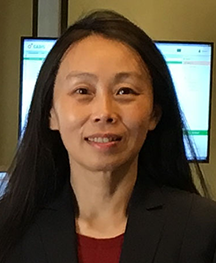 Anne Wang began her biometrics career over a quarter century ago as a research scientist for Cogent (now Gemalto). She’s doing work that she believes makes the world safer. She has contributed to NIST-evaluated, world renowned biometric algorithms and the design of numerous biometric matching software development kits, as well as handheld multi-modal biometric identification devices. Wang recently led the development efforts for touchless biometric capture technology. That’s a long way from her experiences in the early days of the field. The technologies developed by my team make our biometrics solutions and products more accurate, more robust, more user-friendly, and faster. Wang has supported government and commercial clients OBIM (formerly the US-VISIT program), the UK Border Agency’s Visas program, and Financial Information Network & Operations Ltd. In India. She participates in NIST evaluation of Gemalto Cogent fingerprint, facial and iris algorithms as well as several biometric standards subcommittees. Wang and four other winners will be honored with the Women in Biometrics Awards on November 14th in New York City. The Security Industry Association will join SecureIDNews to present the awards during one of the security industry’s most prestigious events, SIA Honors Night.